The far southeast corner of mainland Australia, known as East Gippsland, is a region of mountain eucalypt forests, lowland dry scleraphyl woodlands, coastal heaths and, in sheltered locations, pockets of temperate rainforest. It is to one of these pockets that this recording takes us. The tanin-stained waters of an esturine creek flow silently, almost imperceptibly, soon to join the lower reaches of the Wallagaraugh River. Its banks are lined with a gallery forest of tall euclypts and dense shrubby understory. In the predawn darkness, a Yellow-bellied Glider calls while parachuting among the treetops, a Sooty Owl gives a distinctive cry, a Koala grunts distantly and the first birdsong is heard. As the dawn chorus gathers pace, Yellow Robins, Golden Whistlers, Honeyeaters, Kookaburras, Wonga Pigeons, Fantails and Whipbirds join in. After the chorus ebbs, we hear the delicate song of Rose Robins, the tinkling of Bell Miners, Lyrebirds, King Parrots, Spinebills, Lewin Honeyeaters and Currawongs, while Bassian Thrushes give high-frequency trills while foraging among the leaf litter close by. It really is a spectacular palette of bird sounds. This continuous recording ends with the sharp, piping calls of a tiny Azure Kingfisher and it flies like an irridescent arrow up the waterway. "This recording was made during a field recording workshop I ran during spring. On this morning, I suggested participants making their own recordings using various approaches. 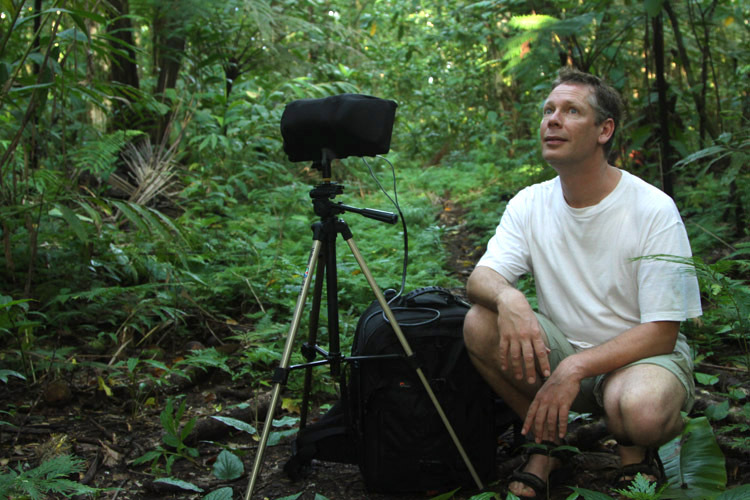 Some had deployed microphones on tripods, while others had small binaural mics attached to their ears, hearing the rainforest exactly as they did while sitting silently. "Meanwhile, after leaving my own microphone rig to have its own adventure, I concentrated on engaging with folks, discussing what we were hearing and just enjoying a rather spectacular morning. I had no thought at the time of sharing the recording beyond those who were there. "But listening back some time later, I found myself enjoying it so much I wanted it available. At times it is quite busy, but with relaxed listening, its not overwhelmingly so, and of course the sheer diversity and vibrancy is a wonder to enjoy. I particularly like the Bassian Thrushes, which can be heard right by the microphones on occasion. It is quite a privilege to hear birdsong this close and unperturbed. "After designing the cover featuring an Azure Kingfisher, I was delighted to recognise one piping on the wing at the very end of the recording - a perfect conclusion to the album." As there is so much biodiversity on this recording, I shall simply list species, notes of their vocalisations and where you can hear them easiest. Eastern Yellow Robin: Loud "chap chap" calls heard from the beginning. Much of East Gippsland is protected within Croajingalong National Park, plus a network of parks and forest reserves covering upland areas. The whole region is remote from major urban centres, and this seclusion has no doubt contributed to it remaining a place with many special areas and rare wildlife. Fire continues to be a threat, especiallu in the drier lowland scleraphyl forests, which have been the sight of significant wildlfires in recent decades. Rainforest pockets such as the one represented on this recording are particularly vulnerable.